I fell in love with this little turtle when I found it. And of course I had to add a little bow to her head. 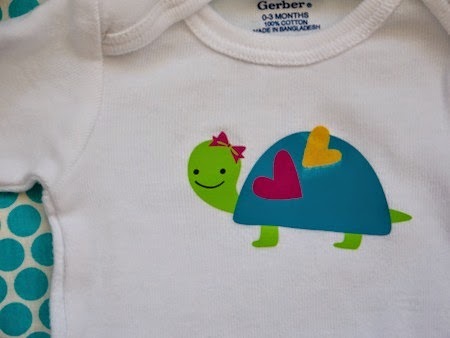 I love using the Silhouette Heat Transfer Material to create fun designs. It makes a project so easy and it looks so professional as well. What's not to love?!! 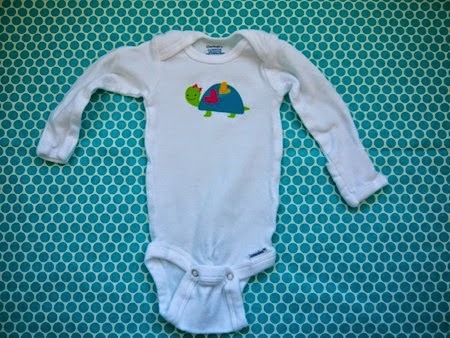 I put this onsie on my little sweet P right after I finished it. As you can imagine, it is already stained from the sweet potatoes she had for lunch. How is it that babies can get food everywhere, even wearing a good bib? Oh well, hopefully my awesome bar of Fels-Naptha soap will get the stains out!